Torn for months over whether to recognize Iraq's U.S.-appointed authority, the Arab League on Tuesday granted the fledgling Governing Council the Iraqi seat on the 22-member pan-Arab body. The decision is the league's first to officially recognize the council — appointed July 13 after U.S. forces deposed Saddam Hussein's regime — as an authority able to represent Iraq on the regional stage. 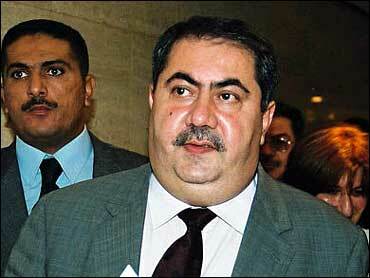 Iraq's first post-Saddam government will play its first Arab League role later Tuesday when Foreign Minister Hoshyar Zebari, the Iraqi Kurdish leader appointed Sept. 1 when the council's Cabinet was named, sits down alongside other Arab League envoys when a two-day foreign ministerial conference begins. Following nearly six hours of closed door talks, Arab League foreign ministers issued a communique saying the Governing Council had been granted Iraq's seat until a legitimate Iraqi government is formed and a new constitution drawn up. "This decision was agreed upon unanimously," Egyptian Foreign Minister Ahmed Maher told reporters following the meeting. By winning increased legitimacy, the Governing Council has helped bolster a Bush administration aim for going to war in Iraq — needing to establish a moderate, representative Iraqi government to replace Saddam's bloody three decade-long rule. Washington has said a new, democratically appointed government in Iraq could also act as a catalyst for reform throughout the Middle East, where most countries have been ruled for generations by royal families or regimes. A U.S. State Department official confirmed reports of the Governing Council being granted Iraq's seat had reached Washington, saying it was a "welcome" development. The Arab League, which opposed the U.S.-led war in Iraq, had been reluctant to welcome the council into its fold, fearing any recognition of it would be seen as a sign of its support for America's invasion of an Arab state. Zebari, Iraq's foreign minister, arrived in Cairo on Monday determined to claim Iraq's seat and fully participate, on behalf of the council, in any Arab League meetings. "This is our right. We are claiming our legitimate right to be here and to be represented," he told reporters before the decision. "Our message is: We're the representatives of de facto Iraqi authority." Iraq's seat on the league's council of ministers has been empty since Saddam's ouster in April. An emboldened Governing Council is expected to help another troublesome area for U.S. foreign policy — the Israeli-Palestinian conflict. The council is expected to steer a more moderate route than Saddam — an avowed enemy of Israel — in reaching a Middle East peace settlement. Saddam's regime vehemently opposed any peace process with Israel, fired Scud missiles at the Jewish state during the 1991 Gulf War, funded militant Palestinian groups, including Hamas, and sent cash donations to the families of Palestinian suicide bombers. The league's decision is also expected to give the Governing Council a bigger say in controlling the flow of Iraq's oil reserves the world's second-largest — into the international markets. The council's increased political standing regionally could be transferred to wider stages too, paving the way for it to be Iraq's official representative at the U.N. General Assembly when it convenes for its annual session later this month.